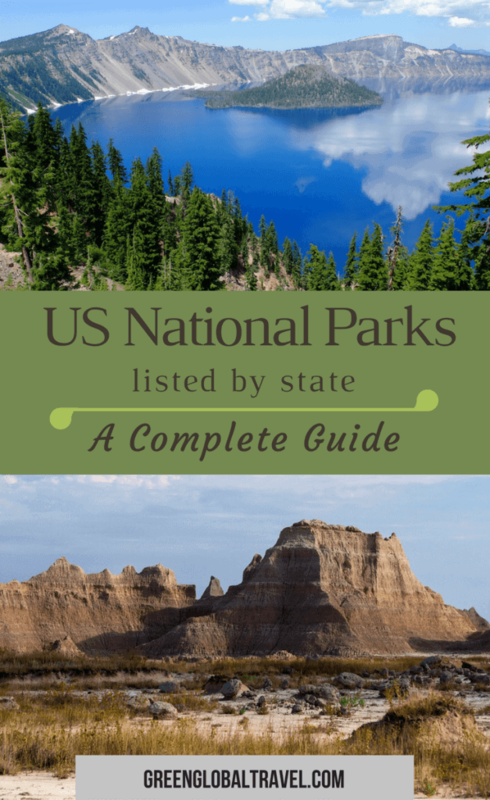 As we began to compile a list of American National Parks by state for this piece to commemorate the 100th anniversary of the National Parks Service, I was shocked and dismayed to realize how few of the 59 officially designated parks we’ve visited. Fortunately, we’re already planning a future family road trip with lots of national parks to visit. The NPS was originally created by Congress through the National Parks Service Organic Act on August 25, 1916. This century-old concept has since been applied to more than 6,ooo national parks in nearly 100 different countries around the world. 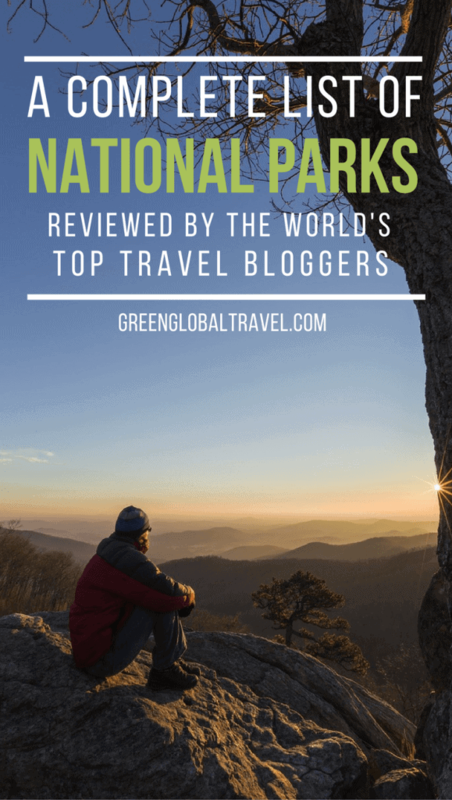 To honor the idea that helped give birth to ecotourism and conservation, we’ve gathered 50 of our travel blogging friends to write mini National Park guides and create an all encompassing list of US National Parks by state. 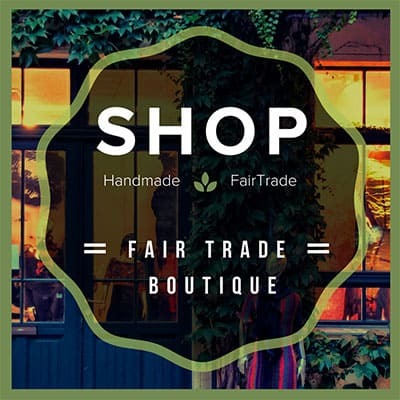 Simply click on the jump links below to navigate to the states you are interested in. With over six million acres of wild, rugged sub-arctic terrain, Denali is home to North America’s tallest mountain, Mount Denali. Only 30% of visitors actually get to see the peak, so I’m grateful for clear skies during my two days there in August 2014. We got an amazing view from the Eielson Visitor Center. In addition to big mountains, Denali has major megafauna, including Grizzly Bears, Caribou, Dall Sheep, Wolves and Moose. I was hoping to see a few big Grizzlies: We saw 18 in ONE DAY! Denali is also the only National Park with a kennel of (super-cute) working sled dogs. Encompassing part of Alaska’s dynamic Brooks Range, this 8,472,506-acre park is both the northernmost and second largest national park in the country. Together with the neighboring Noatak Wilderness Area, it comprises the largest contiguous wilderness in the United States. Due to its remote location north of the Arctic Circle and the fact that there are no roads in the park, Gates of the Arctic attracts very few visitors and is the least visited national park– around 11,000 per year. At the end of high school, my family took an adventurous two-week road trip to Alaska. We drove though many beautiful landscapes, but what stood out to me the most to me was Glacier Bay National Park. The park covers approximately 3.3 million acres that are packed with majestic mountains, glistening glaciers, lush rainforest, wild coastlines and gorgeous fjords. It’s a major highlight of Alaska’s Inside Passage, and part of one of the biggest protected natural areas in the world. We only got to see the tip of the iceberg (get it?! ), but kayaking through freezing waters past jagged blue formations of ice and rock was utterly unforgettable. Located in southern Alaska, Katmai is one of the hardest US national parks to get to. But boy, is it worth it once you arrive! After taking a flight from Anchorage to King Salmon, then a float plane that landed on Naknek Lake, we had to go to Bear school. 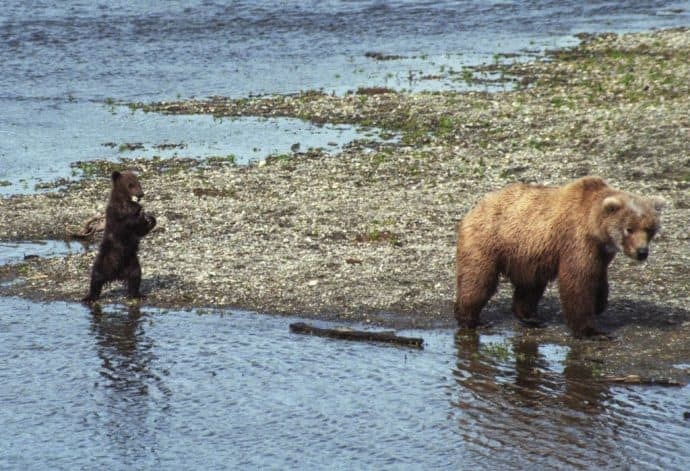 Katmai is considered one of the best places to view Grizzly Bears in the wild, so the National Park Service makes sure that each visitor is well-prepared and safe. We camped for four days at Brooks Camp, where we enjoyed the natural beauty of the Valley of 10,000 Smokes as well as watching the Bears. Located 2.5 hours south of Anchorage, Kenai Fjords features the best of Alaska’s natural beauty within its rugged 669,984-acre expanse. 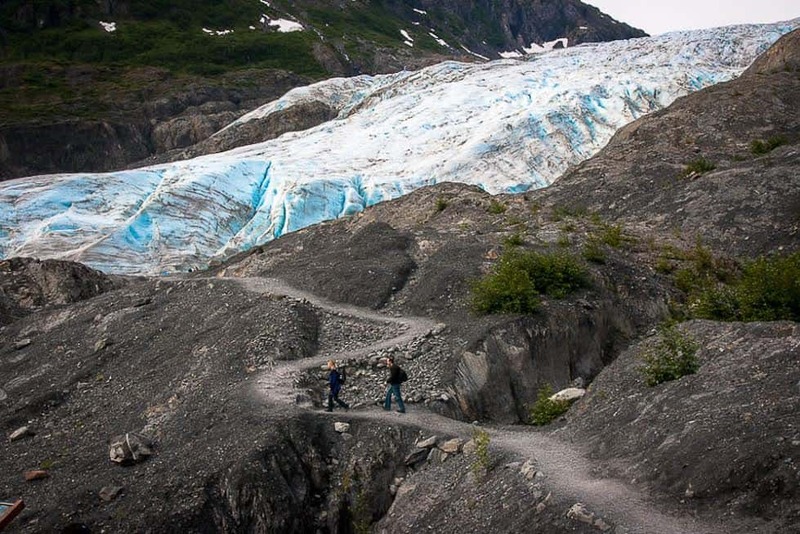 The park is crowned by the Harding Icefield, which gives rise to 38 glaciers that carve out bowl-shaped, forested valleys on one side and slowly crashes into the bays feeding the Gulf of Alaska on the other. Head out on one of the ranger-led glacier and wildlife day cruises, which depart from the town of Seward. Along the way you can spot Sea Lions, Bald Eagles and Puffins nesting along the rocky islands and, if you’re lucky, catch a glimpse of a Humpback Whale or pods of Orcas swimming through the water. 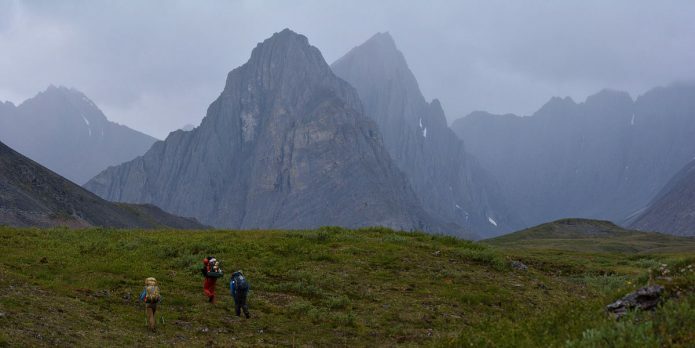 Located in northwest Alaska 25 miles above the Arctic Circle, this remote 1,750,716-acre park has no roads and can only be reached via foot, dogsled, snowmobile, or air taxi out of Nome. As a result, it ranks among the least visited National Parks. 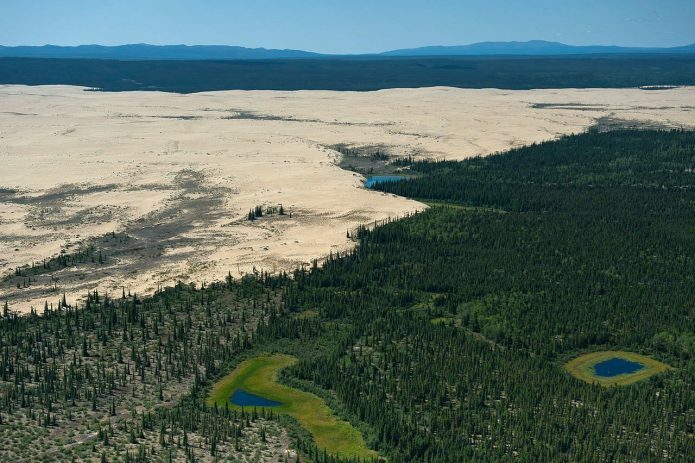 Those willing to make the arduous trek will be rewarded with natural attractions such as the Great Kobuk Sand Dunes, lush wetlands surrounding the Kobuk River and its tributaries, and the Baird and Waring Mountains. If you’ve made it this far in our list of National Parks, you’ve probably realized that most Alaskan parks are remote, uncrowded, and inaccessible by car. 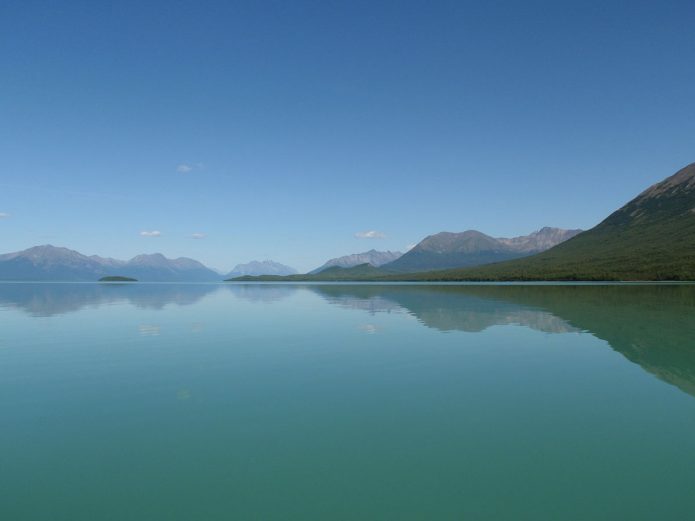 The 4,030,015-acre Lake Clark is no exception: Located 100 miles southwest of Anchorage, it’s accessible only by boat or seaplane. 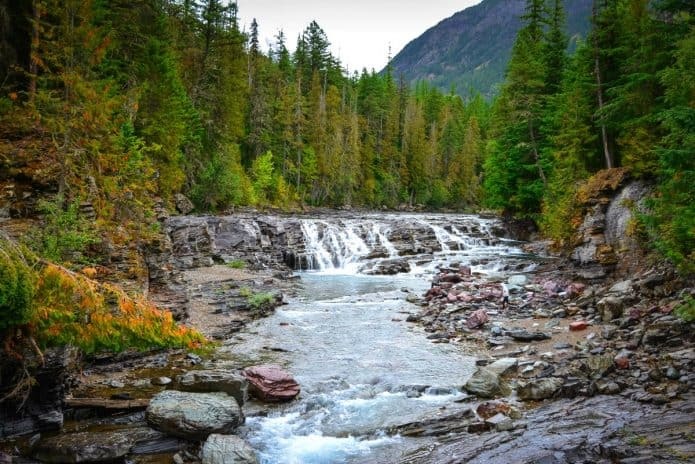 But it is unique in that it’s the only park in Alaska that boasts three mountain ranges, coastal rainforests, alpine tundra, glaciers, glacial lakes, major salmon-bearing rivers, and two volcanoes. This remarkably diverse array of ecosystems means that you can find virtually all the major Alaskan land and marine species within the preserve’s boundaries. The largest National Park in the US at over 13.2 million acres, Alaska’s Wrangell-St. Elias is one of those places that leaves visitors speechless and aching to come back for more. It has some of the highest mountains in Northern America, and is covered by one of the largest ice fields outside the polar regions. 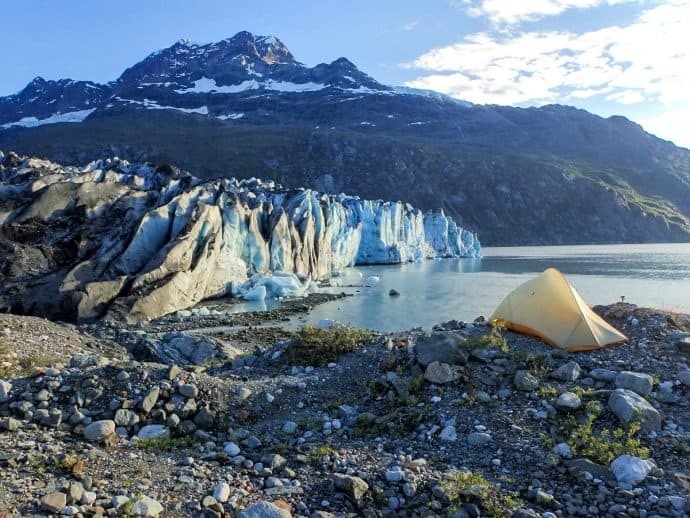 The best way to spend your time in Wrangell-St. Elias is hiking up in the mountains or on the ice of the Root and Kennecott Glaciers. 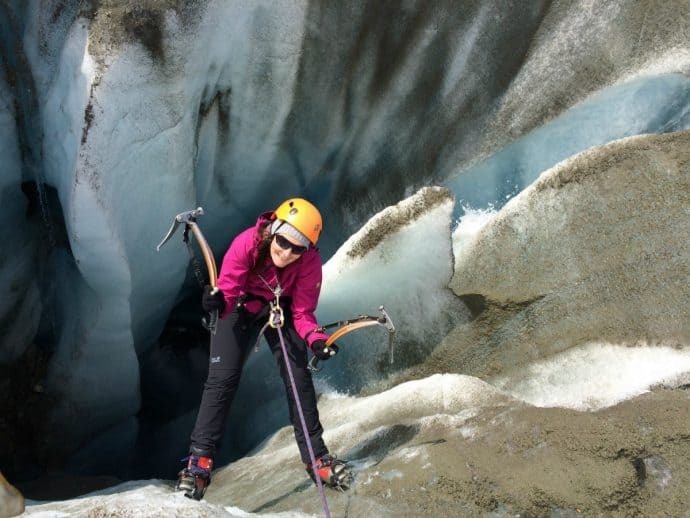 Last time I visited I went ice climbing, which proved to be the experience of a lifetime. Located 1,615 miles from Hawaii, American Samoa is a tiny speck in the middle of the Southern Pacific best known for its US Naval base and prominent role in the Tuna industry. But it’s also an incredibly rugged place, with sharp escarpments reaching down to the sea, low-hanging rain clouds, and lush vegetation. 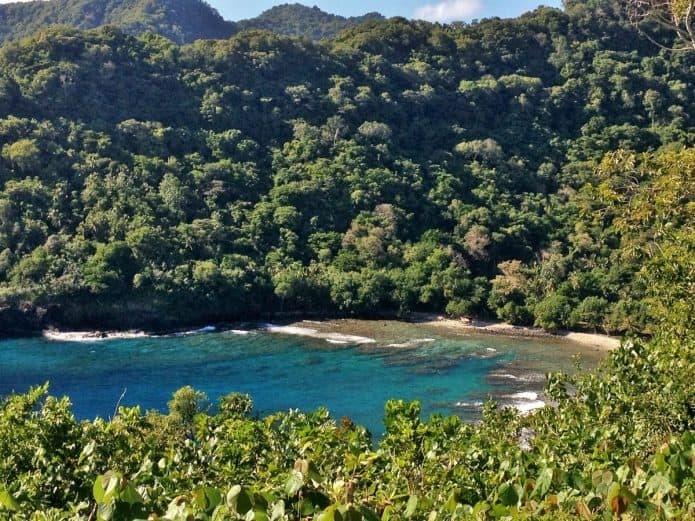 The most beautiful place in this 3-island conservation area is the reefs and beaches of Fagatele Bay, where you can often see Sharks, Whales, Sea Turtles and Giant Clams. Take the short trail to Pola Island and you’ll likely find yourself alone, watching waves crash on the rocky beach. There are well-marked trails all over the rainforest, and you can get a map from the Tourism Office. When I was there the officer in charge had not seen a tourist in 5 days, and she even lent me her car! No photo can capture what it’s like to look out over the rocky ledge, down into the vastness of this deep gully carved into the landscape over thousands of years. Start at the Visitor Center: The rangers can give you insight on where to go and what to do. The north rim is more seasonal than other entry points: Even at the beginning of the season, it can be closed off due to wild weather. One of my favorite things about the Grand Canyon is that you aren’t confined. A few spots have guardrails, but a quick walk down the path leads you to a number of lookout points where you’re allowed to climb out onto the rocky ledges (at your own risk) to drink in the view. At first glance, northeast Arizona’s Petrified Forest National Park doesn’t look so different to the surrounding desert. 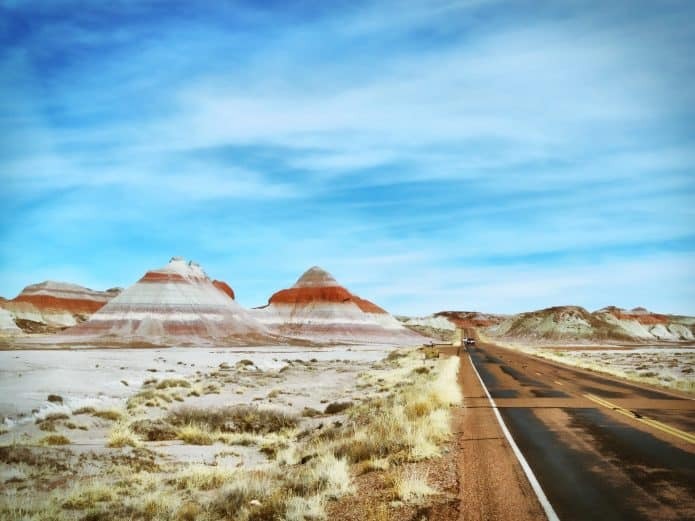 Only as you make your way deeper into the park do you begin to notice the brightly colored stratified rock formations, the massive trunks of glittering petrified wood, and the dazzling colors that lend the area its “Painted Desert” moniker. The Petrified Forest is known for its ancient fossils– fallen trees that date back to the Late Triassic Period (around 225 million years ago). 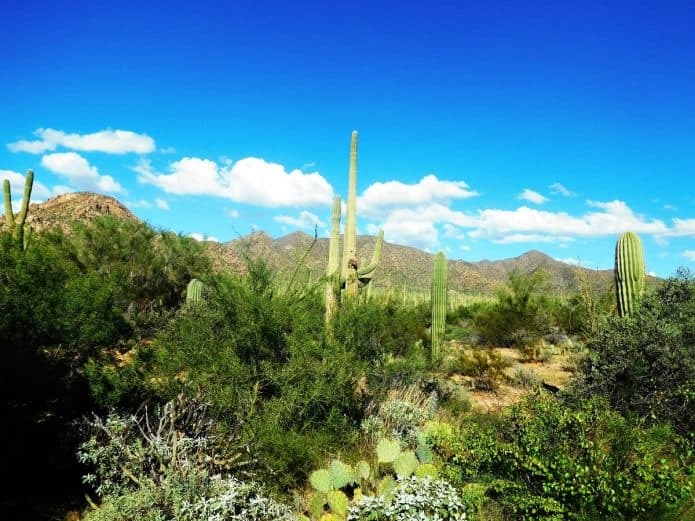 Arizona’s 91,442-acre Saguaro National Park, which is named for the giant cacti that grow in the Sonoran Desert, is actually two parks in one. Rincon Mountain District (east) and Tucson Mountain District (west) are 35 miles apart. 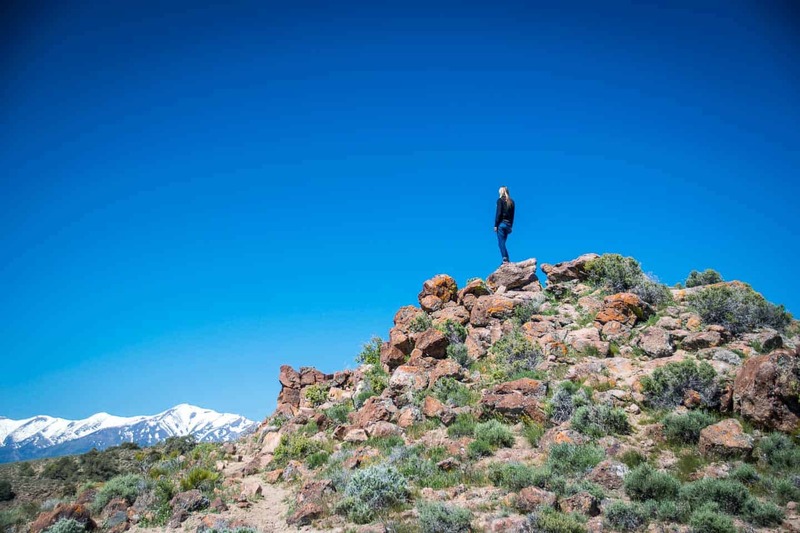 The high desert Rincon offers a paved loop that visitors can bike or drive, hiking trails, backcountry camping, as well as expansive mountain and sunset views. Tucson Mountain, with its lower elevation, offers a desert-like environment with more saguaros– a whole forest full of them. Visitors can also access ancient petroglyphs from the Signal Mountain Trail. 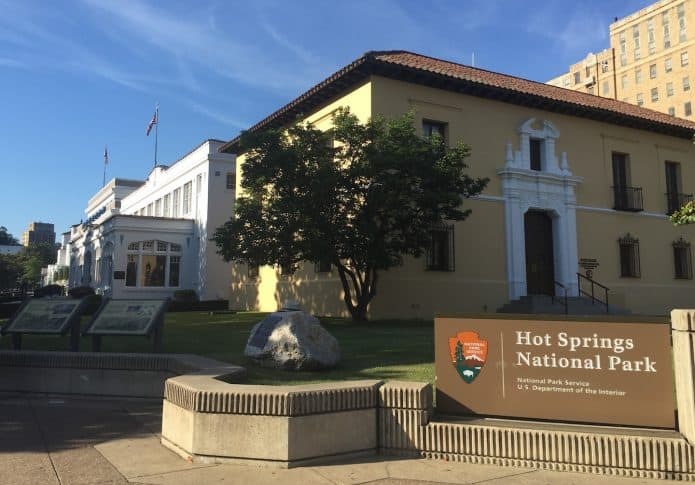 Located in Arkansas, Hot Springs is first piece of land set aside for its natural features by the federal government for preservation (in 1832). It’s also not your routine, get-back-to-nature national park. True to its name, the park centers around a collection of hot springs that drew thousands to the area in the 19th century to take advantage of the perceived healing waters. Today you can tour the Fordyce bathhouse, which serves as the park’s visitor center, along Bathhouse Row. 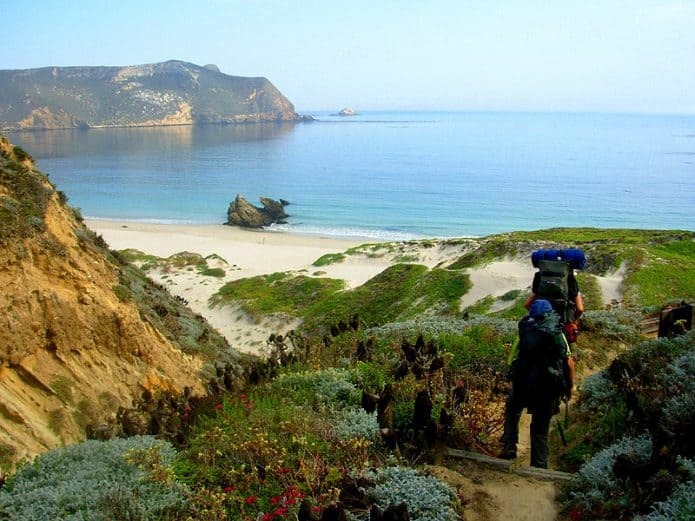 As its name suggests, this 249,561-acre park encompasses five of the eight Channel Islands off the southern coast of California. The largest of these, Santa Cruz Island, is mostly owned and managed by The Nature Conservancy. The six nautical miles around the park are also protected as a National Marine Sanctuary. As such, water sports such as Scuba diving, spearfishing and kayaking are popular draws, as are tours to see the endangered Blue Whale. The islands also serve as home to over 2,000 species of plants and animals, including endemic wildlife such as the Deer Mouse, Spotted Skunk, Channel Islands Fox and Island Fence Lizard. Straddling the border of California and Nevada, Death Valley is a park of vast spaces and big titles. Anyone who visits will want to see the vast expanses of Zabriskie Point and Badwater, which (at 282 feet below sea level) is the lowest point in the Western Hemisphere. One of my favorite things in the park is swimming in the natural hot springs water, which is pumped into the pool at The Inn at Furnace Creek. The Inn is also a superb spot to be at dusk, when most people have gone for the day. The park becomes quiet and peaceful, and you can see across the valley floor forever. My favorite national park is California’s 790,636-acre Joshua Tree National Park, mainly for its otherworldly scenery. 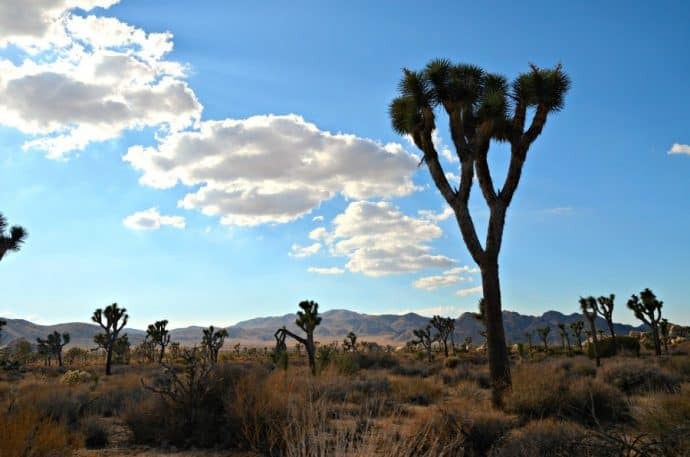 The park reminds me of something from Dr Seuss, with its plethora of spiky Joshua Trees, gnarled branches twisting from the ground, and abandoned rock piles across the barren landscape under a boldly clouded sky. It’s no surprise to learn that Joshua Tree is a place where psychedelic enthusiasts went to experiment with trippy cactus teas, or where people claimed to have spotted UFOs. There’s a certain mystique surrounding this park, which I felt on a hike to summit Mount Ryan. 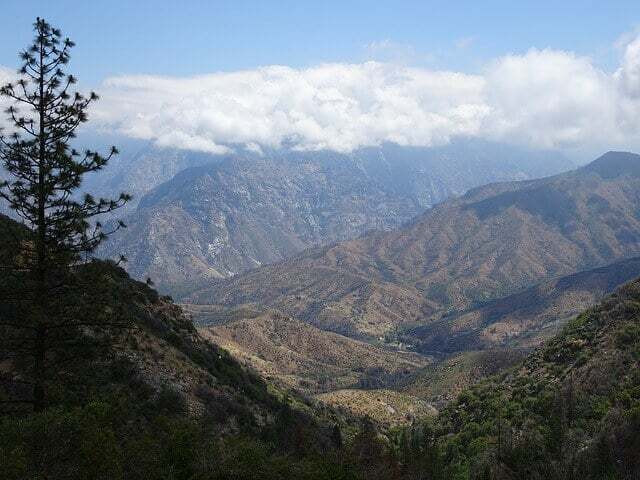 Located in the southern Sierra Nevada, King’s Canyon gets far less visitors than Seqouia (its neighbor to the south) or Yosemite National Park. This is partly by design: Post-WWII debate over preservation vs. progress was won by the conservation enthusiasts. As a result, the park has limited accommodations and services, and most of the 462,000-acre wilderness has limited road access. Thus the park’s rugged natural beauty remains relatively pristine. The glacier-carved valley for which it’s named is surrounded by stunning 14,000-foot peaks, raging rapids, gorgeous mountain meadows, and some of the largest stands of Giant Sequoia trees in the world. Cedar Grove is the only other commercially developed area, boasting a Visitor Center, the Cedar Grove Lodge, a market, and campgrounds. There are many attractive aspects to Lassen, but two stand out: First, the comically named Bumpass Hell, and second, the Cinder Cone. 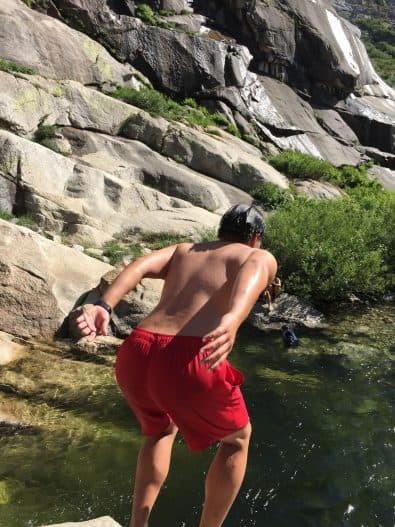 You reach Bumpass Hell via a one-mile trail which starts near the park’s southwest entrance. This active hydrothermal area features geysers, fumaroles, and highly acidic ponds. It was named for an early explorer who severely burned his leg when he fell through the geothermal crust. Stay on the well-marked paths and boardwalks so you don’t do the same. 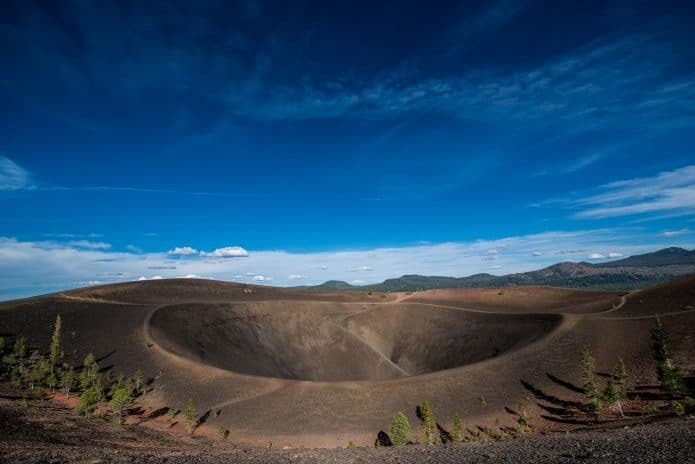 Cinder Cone is the remnant of a recently active volcano. As the name suggests, it’s a big pile of volcanic material, and you can climb it to enjoy the view of a crater that’s only a few hundred years old. The climb is slightly strenuous, mostly due to the 8000-foot altitude rather than difficulty. You reach Cinder Cone by driving all the way around the park to the northeast entrance, then taking six miles of bad road to the parking lot. Located 80 miles southeast of San Jose near California’s Salinas Valley, this 26,606-acre park is named after its distinctive geological formations– the eroded remains of an extinct volcano that originated on the famed San Andreas Fault (which is 200 miles away). Established as a National Monument in 1908, it became the nation’s newest national park in 2013, when it was signed into law by President Obama. Archaeological surveys of the area found 13 sites once inhabited by Native Americans (primarily the Ohlone people), one of which has been dated to around 2000 years ago. 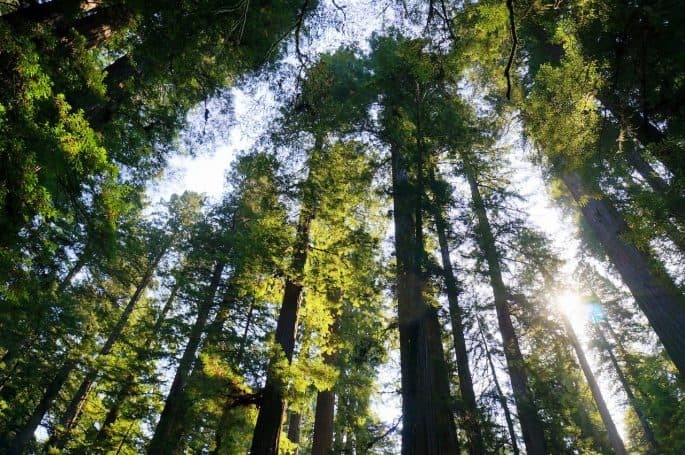 Northern California’s 112,618-acre Redwood National and State Parks is home to the tallest trees on Earth. These old-growth coastal redwoods can grow up to 375 feet tall–about the same size as the Statue of Liberty. This UNESCO World Heritage Site is spread out among the national park and three state parks, which include prairies, woodlands and 40 miles of rugged coastline. We especially loved the hiking trails at Jedediah Smith Redwoods State Park. 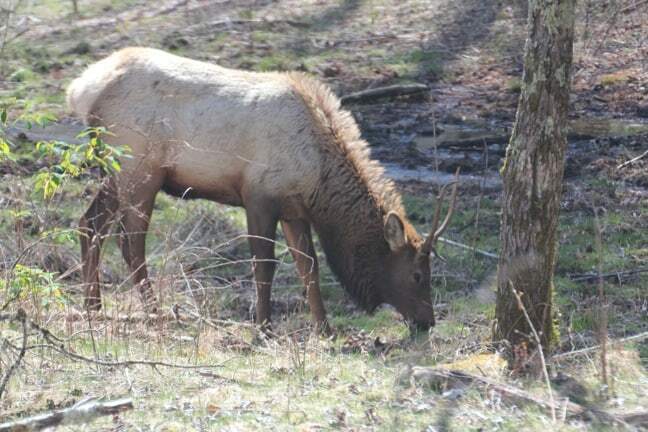 Don’t miss seeing the Roosevelt Elk herds and making a visit to Fern Canyon at Prairie Creek State Park. Located in California’s southern Sierra Nevada, Sequoia National Park spans over 406,000 acres and shares a common border with Kings Canyon National Park. When you come through the proper entrance to the park, you will see reference to both of these majestic areas. As my family and I hiked through various trails we were constantly struck by the park’s pastoral beauty. Here a visitor can see the largest tree on Earth (the General Sherman Tree), see Deer and Bears in their natural habitat (make sure to safely store your food away), walk to a beautiful waterfall, and go for a freezing cold swim. As I drove around the corner, I had to slam on the breaks. Was it traffic holding me up? An animal wandering in the road? No, it was simply the sheer majesty of Yosemite National Park. As you can see from the photo above, it was worth leaving some rubber on the tarmac. As we celebrate a century of US National Parks, let’s show some gratitude to the park that started it all off. In 1864, President Abraham Lincoln signed the Yosemite Grant, which in effect stopped commercial interests from developing in Yosemite National Park and preserved 747,956 acres of stunning beauty for all to enjoy. 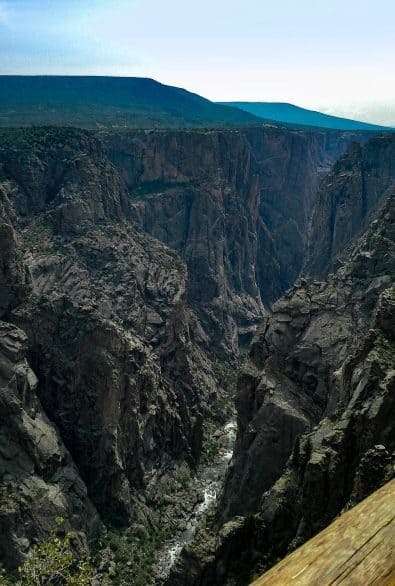 The views of the near 2,000-foot vertical drop to the Gunnison River had me clutching the sturdy rails of the overlooks. This lesser-known Colorado canyon holds a few treasures over its more popular (and “Grand”) counter-park. There are virtually no crowds and zero poisonous snakes here. Plus you get t0 enjoy the Milky Way in all of its glory, due to Black Canyon’s designation as an International Dark Sky Park. There are also ranger-guided boat tours into the Canyon (via the Curecanti Recreation Area). Boasting the tallest sand dunes in North America, this national park easily ranks among the most breathtaking places I had the pleasure to visit during my tour across the United States. I had the privilege of spending a long weekend here just as things were starting to cool down for Autumn, and I couldn’t imagine a better time to visit. As far as things to do, I highly recommend camping for a few days and renting a sandboard or sled to go sliding down the dunes. I’d also recommend bringing your camera to the peak of High Dune, which sits at approximately 8,874 feet above sea level, because the views are spectacular! For less adventurous travelers there’s also hiking trails, birdwatching, and boogie boarding in Medano Creek in the spring. Ten years ago, I embarked on my first-ever road trip around the western US. Our visit to Colorado’s Mesa Verde National Park was short, but it left a lasting impression on me. 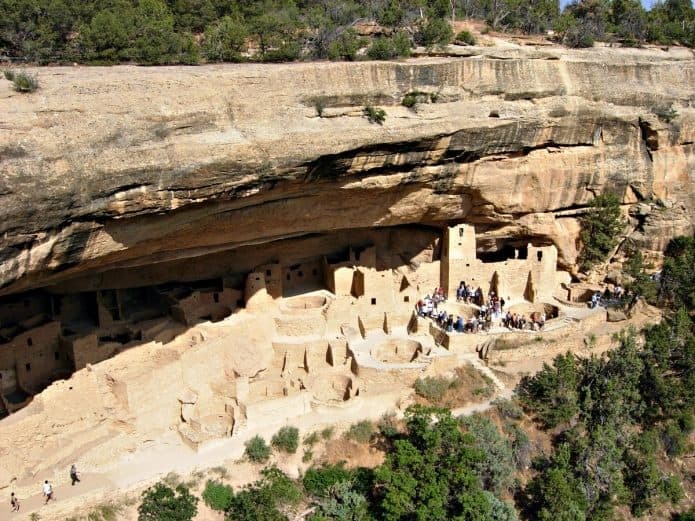 Mesa Verde (Spanish for “green table”) is known for 600 impressive dwellings of the Ancestral Pueblo people, who constructed their homes beneath overhanging cliffs and lived there from AD 600 to 1300. We were taken through several of these dwellings on a guided hike, which included several steep ladders and meandering paths. Rocky Mountain National Park is one of our absolute favorite places in Colorado. The 265,761- acre park offers trails for hiking, mountain biking, snowshoeing and cross-country skiing. It’s a haunting sound you’ll never forget! Other critters you may spot include Black Bears, Beavers, Mountain Lions and Coyotes. As a native New Yorker, I didn’t discover America’s National Park System until my post-collegiate adventure took me out west. Now that I’ve relocated to the Florida Keys, the park system is not too far away. 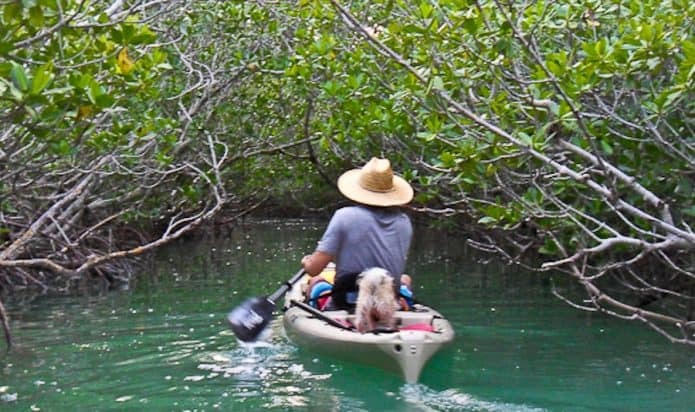 Inside 172,971-acre Biscayne National Park (which is located just south of Miami), the trail maps are for canoes and kayaks instead of hikes. Visitors spend most of their time on and in the water. Whether navigating the waterways through the mangroves or snorkeling (or diving) the protected reef system, most of the “land” in this park is underwater. Besides it proximity, another reason I love Biscayne National Park is the wildlife. The park’s centerpiece is Fort Jefferson, a large masonry fort located on Garden Key. Architecture lovers and history buffs will be in their element here, but it’s the vast ocean views and opportunities to spot sea birds and marine life that will make you fall in love. Don’t miss out on the spectacular snorkeling! 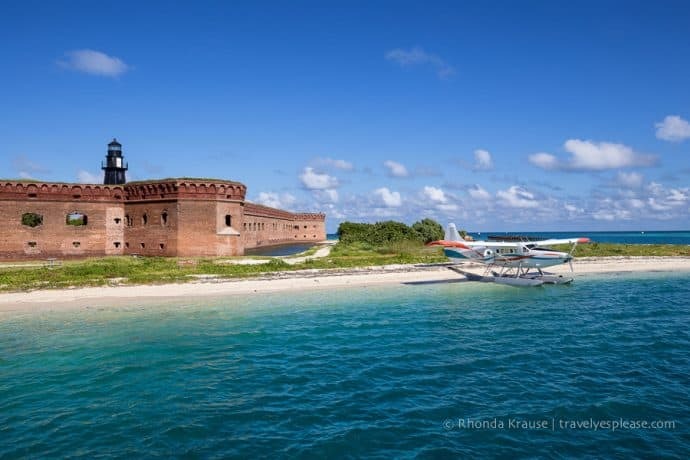 Dry Tortugas is a remote location, and most of its coral and sand islands are undeveloped. Often referred to as the “amazon of North America,” the Florida Everglades are a natural region of tropical wetlands in South Florida. They provide important habitat for a number of rare and endangered species, including the Manatee, Florida Panther and Florida Black Bear. This is the only place on the planet where Alligators and Crocodiles co-exist, and also the only place that boasts more than 40 different species of rare Orchids. 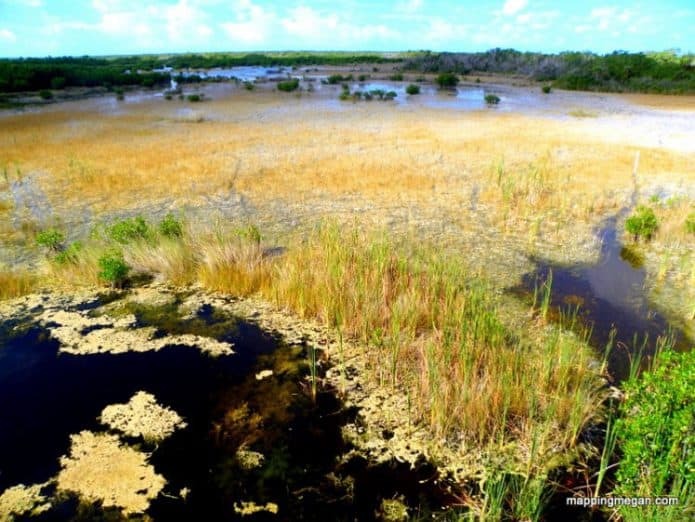 The Everglades are completely wild and unpopulated. Dominated by grassland and swamp, dotted with tree islands, forests and rivers, the whole area has a wild beauty about it. 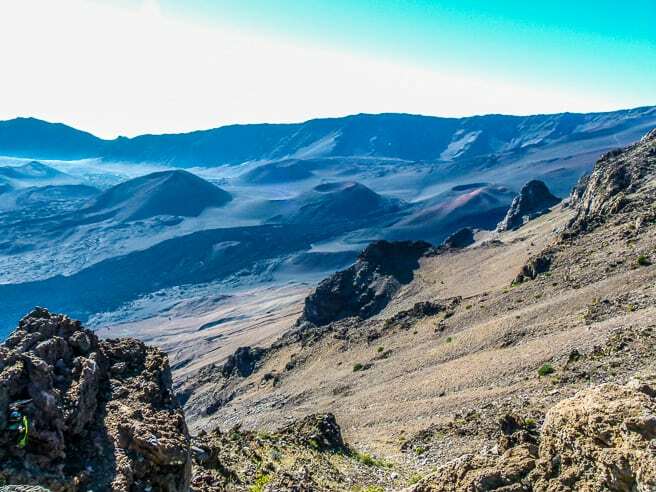 Located on the Hawaiian island of Maui, Haleakala means “house of the sun.” According to local legend, the god Maui locked up the sun here to lengthen the day. The park is divided into two sections, volcanic East Maui and coastal West Maui. The east side is frequented by visitors wanting to get on top of Haleakala. A paved road leads to the top, which you can drive up for a gorgeous sunrise, bike up to take up the “Cycle to the Sun” challenge, or book a tour and bike down the volcano. Fair warning: Biking up will challenge you both physically and mentally. The 36-mile climb (which reaches 9,842 feet above sea level) is a treat for the eyes and a test of your stamina. It was quite an experience! If you want to visit the most active of the five volcanoes that make up the island chain of Hawaii, you’ll have to make a trip over to Hawaii Island to visit Hawaii Volcanoes National Park. The goddess Pele is said to reside within the summit caldera of Kīlauea. Currently there is lava flowing into the ocean again! A wild and magical place to visit, there are endless adventures to be had within the 323,431-acre park. You can pitch your tent and camp out under a wide expanse of stars due to the low amount of light pollution. 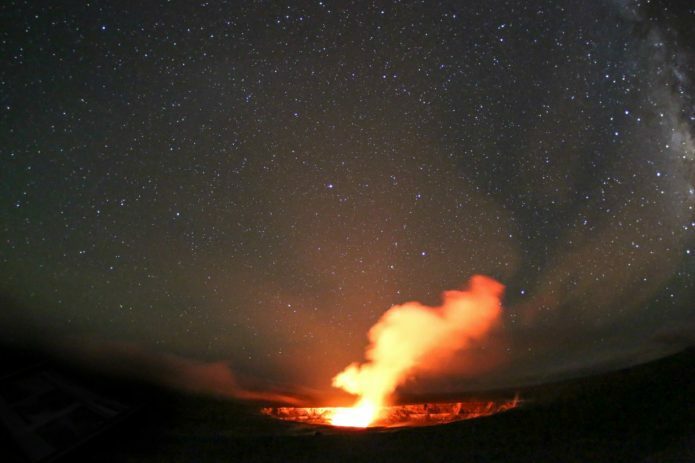 It’s even dark enough at night to see the glow of Kīlauea’s active volcanic crater, Halemaʻumaʻu! Don’t be disappointed if I tell you that no Mammoth bones were ever found in Mammoth Cave. In fact, this fascinating 52,830-acre park gets its name from the fact that it’s the world’s longest known cave system, with more than 400 miles explored. It’s so massive, so impressive that I found it difficult not to stare in awe for a very long time. 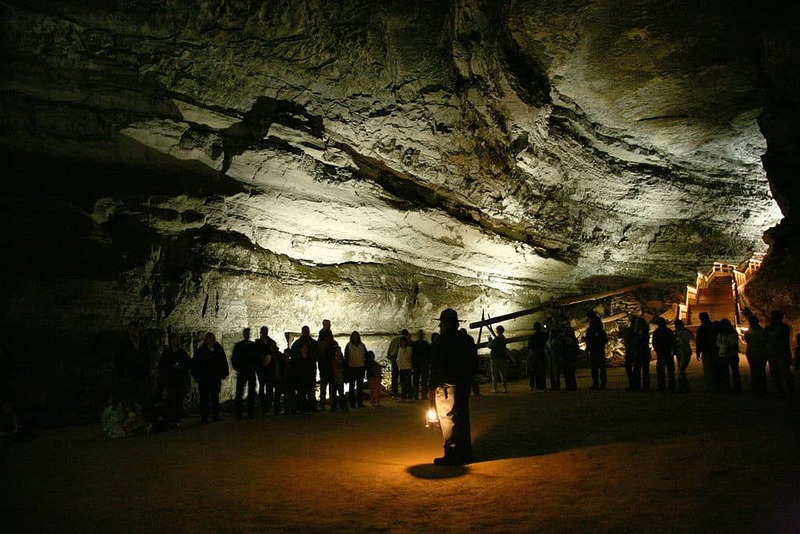 Be sure to take one of the fantastic cave tours that the park rangers lead during the summer. There are lots of them, and they cover everything from the history to the geology of the cave. To be safe, book the tour in advance to secure yourself a spot on your favourite one. 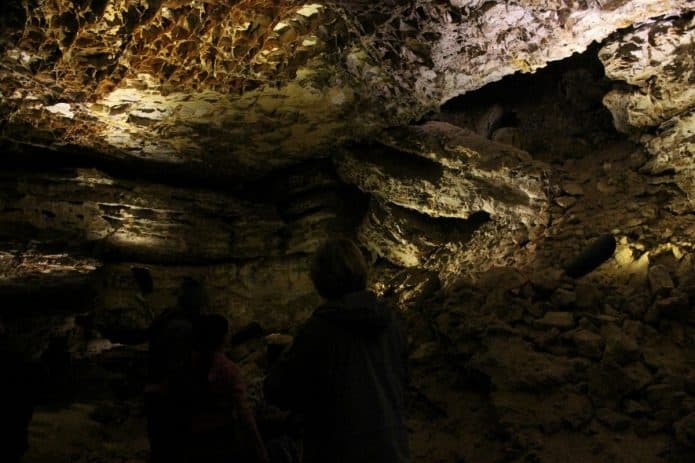 Once you have spent enough time underground exploring the caves, you can always go for a hike and follow the River Styx Spring, the Echo River Springs, or the Green River Bluffs trail. Maine’s Acadia National Park is one of the most famous (and heavily visited) parks in the country. But while it’s insanely busy in the summer, there are plenty of quieter nooks and crannies to explore. Take a drive around the entire island and stop off in harbors or areas of the park that draw you in. Walk the carriage trails, or head down to Little Hunters Beach with your dog. 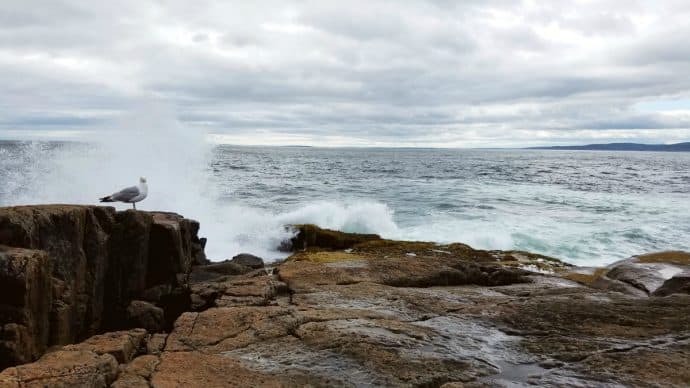 Even better, head over to the Schoodic Peninsula section of the park. 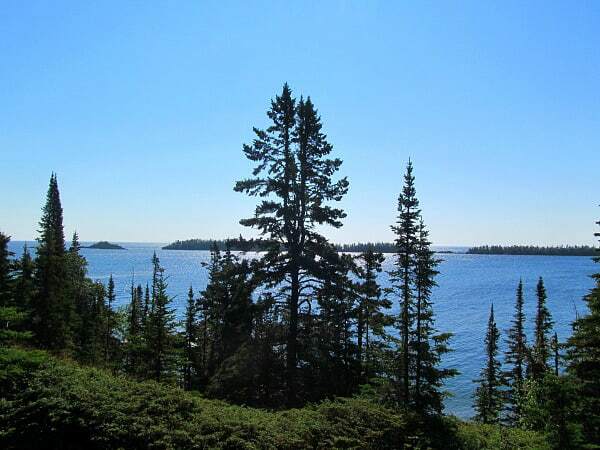 You might be hearing about Michigan’s 893-square mile Isle Royale National Park for the first time… which is no surprise considering the fact that it perennially rates as one of the country’s least visited national parks. Isle Royale is actually a 45-mile long by 9-mile wide island smack dab in the middle of one of the world’s most beautiful lakes, Lake Superior. This national park features over 165 miles of backcountry hiking trails, campgrounds, and countless inland lakes. Despite being an island, there are Moose, Red Fox, and a declining population of Wolves. Located in northern Minnesota, 218,200-acre Voyageurs National Park pays tribute to the French-Canadian fur traders who were the first Europeans to travel through the region. The park is made up of four main lakes and hundreds of islands, so the best way to enjoy it is to explore via the water. 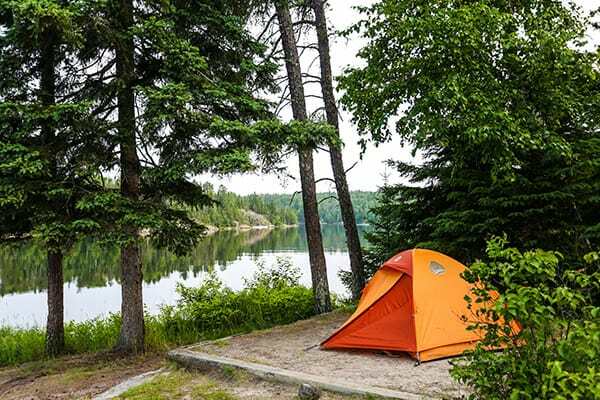 Camping at Voyageurs is a bit different than at most national parks: You can stay at either a boat-up-only campsite or in a houseboat-designated site on the water. With over 52 miles of hiking trails and 110 miles of snowmobile trails, Voyageurs can be enjoyed year-round no matter what the weather brings. Glacier National Park is located in northern Montana and crosses the Canadian border, with a number of breathtaking glacier-carved peaks and valleys. Myriad wildlife can be spotted throughout, including Bears, Bighorn Sheep, Elk, and Mountain Lions. Whether you’re more intrigued by the alpine scenery or the relaxing sight of glacial lakes and cedar forests in the lower valleys, the ultimate experience is passing through the 50 miles across the interior on the park’s iconic “Going-to-the-Sun” road. 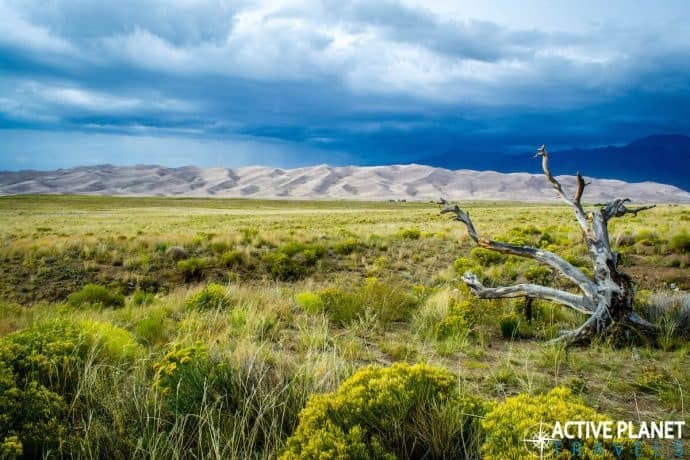 Located in Nevada near the Utah border, Great Basin is considerably less well-known than historic parks like Yellowstone and Yosemite. It’s one of the nation’s newer national parks (established in 1986) and also one of the least visited, with approximately 90,000 visitors a year. 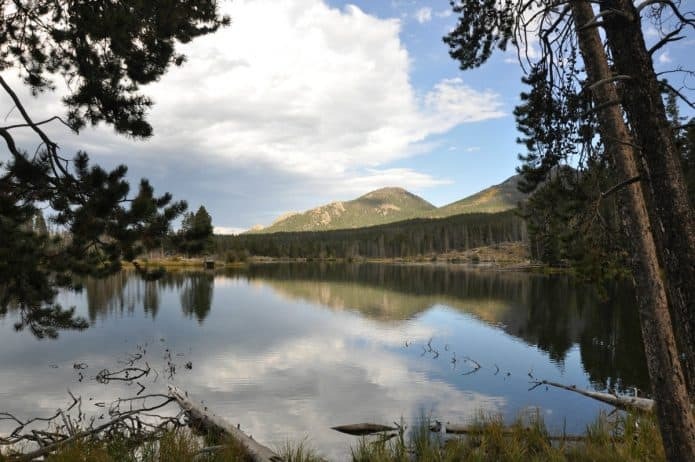 The park’s 77,100 acres offer attractions such as the Lehman caves, the 13,000-foot summit of Wheeler Peak, wildlife (including 61 species of mammals, 18 species of reptiles, 238 species of birds, and 2 species of amphibians), hiking trails, and the adjacent Highland Ridge Wilderness. New Mexico’s Carlsbad Caverns is truly unique. Discovered in the early 1900s, these enormous underground caves were carved by flowing water some 6 million years ago. Walking inside them is a meditative experience, with a constant temperature of 56°F providing welcome respite from the heat of New Mexico’s sun. The most popular attraction is the Big Room, which is large enough to hold six football fields. The King’s Palace and the Queen’s Chamber are smaller caverns that provide a more intimate experience. 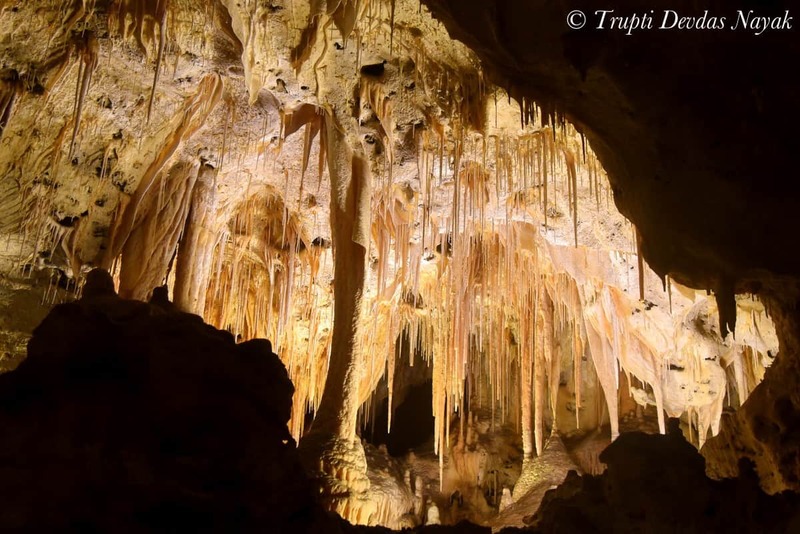 Every surface of Carlsbad Caverns is adorned with exquisite stalactites and stalagmites and other intricate geological formations. It’s an amazing place to admire the slow, steady work of flowing water as it carves and dissolves rock into spellbinding sculptures over the eons. Established in 1940, the most visited National Park (around 11 million people annually) is also among its most beautiful. Approximately 95% of its 522,419 acres are lush green forests teeming with flora and fauna, with 10,000 plant and animal species that include black bears, deer, birds and more. 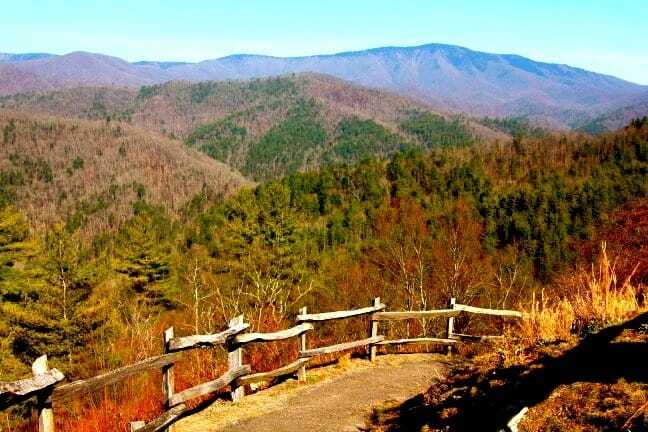 There are also 16 mountains in the park with summits of 6,000 feet or more; nearly 900 miles of hiking trails; and driving tours that provide gorgeous views at places like Cade’s Cove and Newfound Gap Road. Here is another national park that ranks high on the least-visited list. The 70,446-acre park is located at the western end of North Dakota, near the Wyoming border. Visitors get two for the price of one here, as there are southern and northern units. 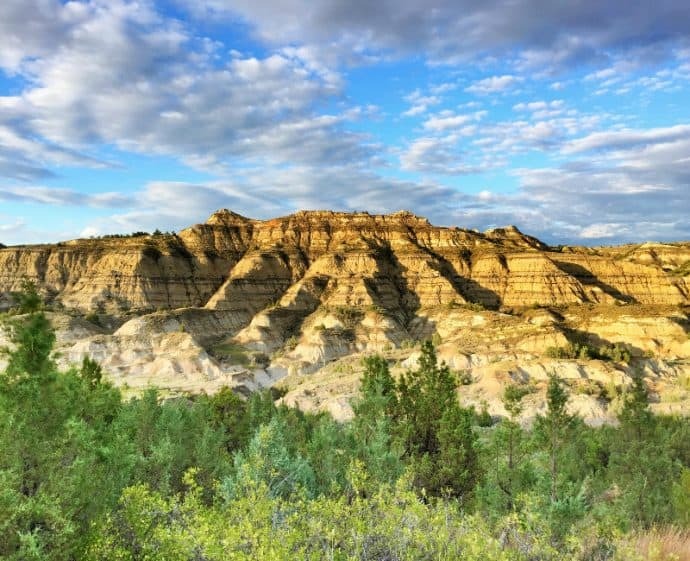 The best way to describe Theodore Roosevelt is like Badlands National Park, but with trees and a little more color. 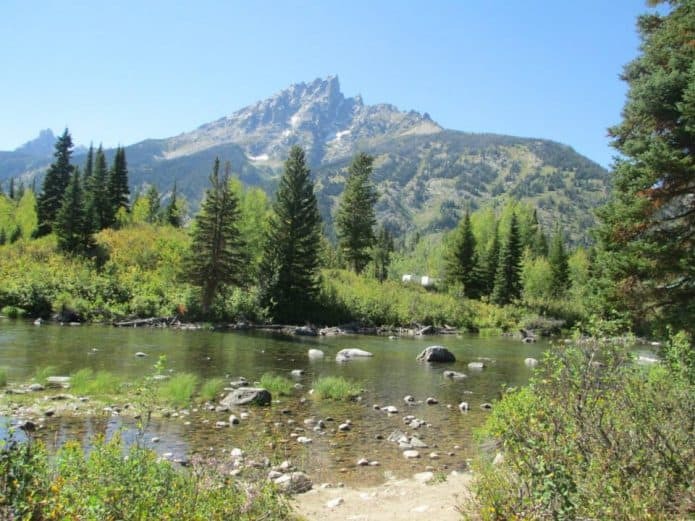 The backcountry camping is exceptional, with the 18-mile Achenbach Trail a highlight. 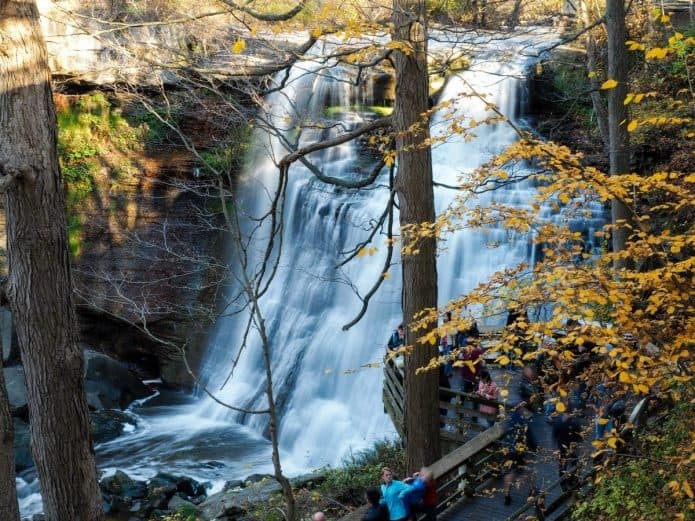 Located along the Cuyahoga River between Akron and Cleveland, this 51-square-mile park holds the distinction of being the only National Park in the state of Ohio. Averaging over 2.2 million visitors a year, it attracts locals and out-of-towners alike with its lack of entrance fee and extensive system of wooded trails and bike paths. Established in 1902, Oregon’s Crater Lake is the fifth oldest National Park in the US. 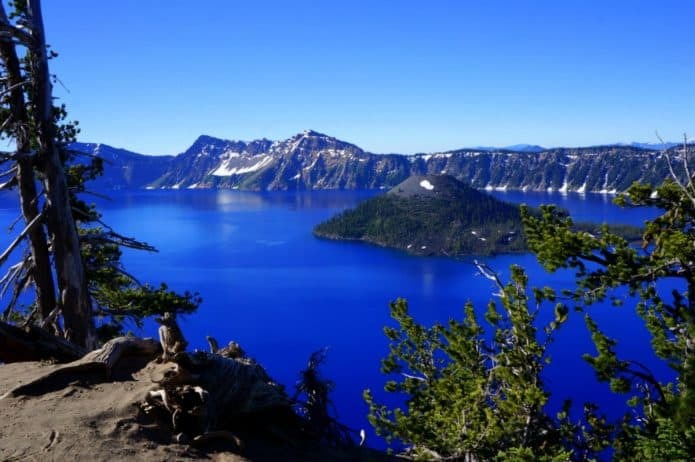 At a maximum depth of 1,949 feet, the country’s deepest lake remains just as awe- inspiring now as it was around 7,700 years ago, when Mount Mazama’s volcanic eruption and collapse created this beautiful crater. Filled with crystalline blue water, this is a majestic site that simply must be seen in person. With winter snow often lasting well into the summer, a late summer visit is best in order to fully explore all areas of the park. From wildflower-lined trails in the valley to crater rim hikes, there’s something for everyone here. 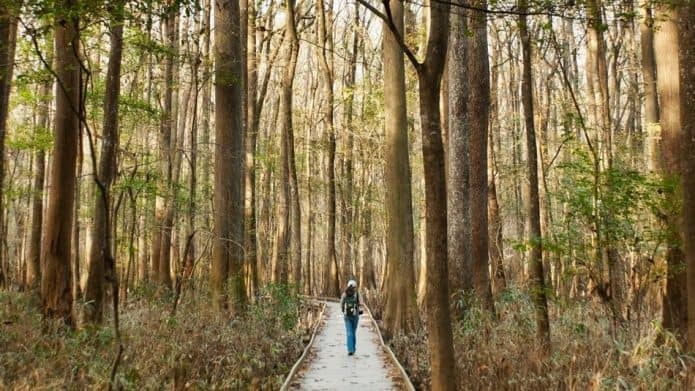 Thanks to a grassroots Sierra Club campaign begun back in the late ‘60s, this 26,546-acre park in South Carolina preserves the nation’s largest tract of old growth bottomland hardwood forest. Its floodplain features lush “champion” trees that are among the tallest in the Eastern United States, which form one of the world’s highest temperate deciduous forest canopies. Combined with the Congaree River (which flows through the park) and more than 15,000 acres of designated wilderness, it’s a fertile sanctuary for wildlife ranging from Bobcats, Feral Pigs and Coyotes to Deer, Turkeys and Otters. 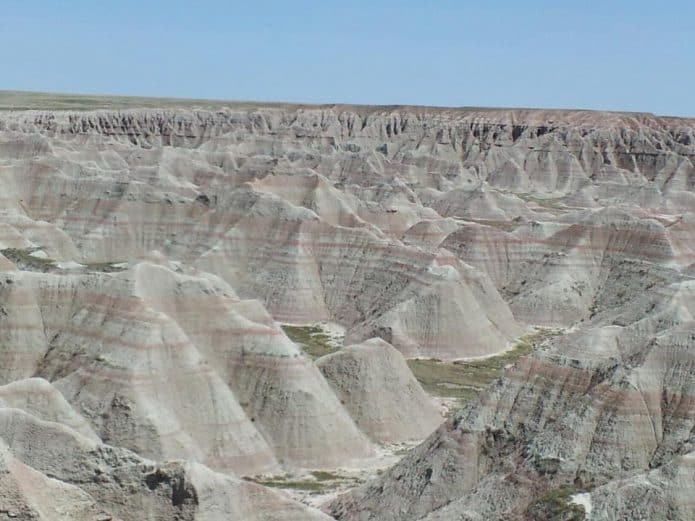 South Dakota’s Badlands National Park is an expansive, impressive place. Visitors come from all over the world to admire the mysterious beauty of the park’s famous buttes, spires and pinnacles, which dramatically jut out from the Earth. 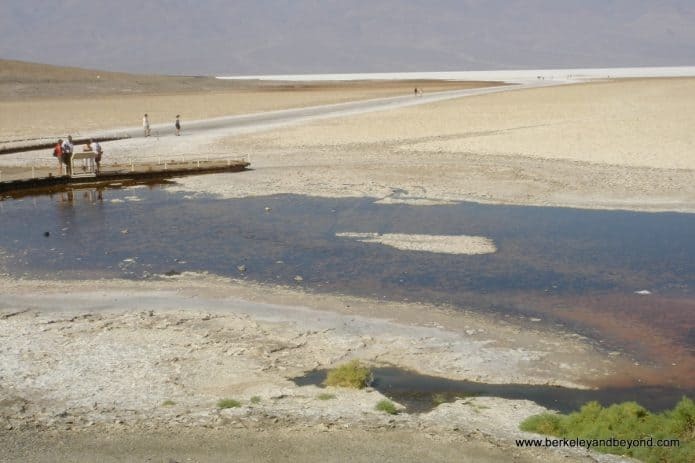 This desolate and fascinating area has been ravaged by extreme elements over the eons. The erosion has revealed colorful sedimentary layers, leaving a picturesque quality to the landscape. 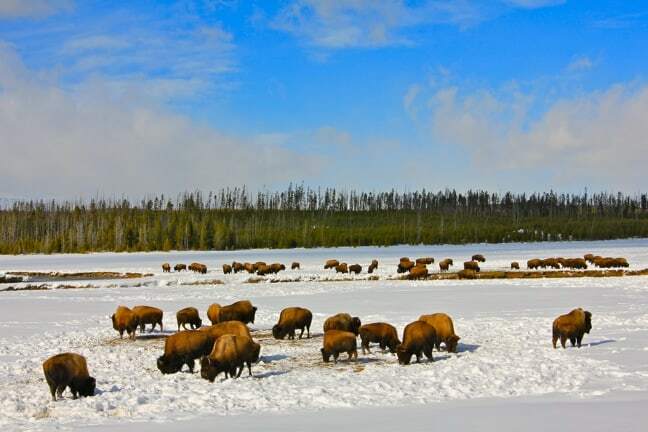 The park consists of around 244,000 acres, where wildlife such as bison, bighorn sheep, and prairie dogs roam freely, and humans are thankfully in the minority. Nestled in the famed Black Hills of South Dakota, 33,847-acre Wind Cave National Park is littered with vibrant wild sunflowers, Bison munching on rustling grass along the tree line, and Prairie Dogs poking their tiny heads out of their burrows whenever a car passes. But the true glory of the park lies underground. The caverns below weren’t explored until the 1880s. But today, guided tours of various difficulties wind in and out of the damp caves. Established in 1940, the most visited U.S. National Park (around 9 million people annually) is also among its most beautiful. Approximately 95% of its 522,419 acres are lush green forests teeming with flora and fauna, with 10,000 plant and animal species that include black bears, deer, birds and more. 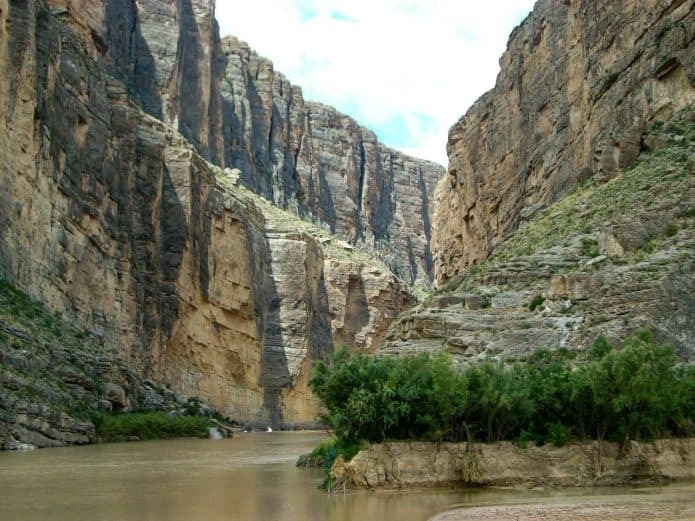 Time seems to slow down in the vastness of Texas’ Big Bend National Park, which is set along the Rio Grande River flowing between Mexico and the US. At 801,163 acres, it’s large enough to warrant a gas station, grocery store, and four visitor centers. Scenic drives– both paved and off-road– allow visitors to enjoy the diverse ecosystem, which includes the country’s largest protected area of Chihuahuan Desert. The park is a showcase of flatlands, mountains, canyons and color, home to around 1,200 species of plants, 450 species of birds, 56 species of reptiles, and 75 species of mammals. Located about 25 miles south of Carlsbad Caverns, this 135 square mile park is best known for the peak of El Capitan, which was historically used as a landmark by stagecoaches traveling through west Texas. You can still see the ruins of an old stagecoach station near the Pine Springs Visitor Center today, and the Frijole Ranch House boasts a small museum on the area’s ranching history. 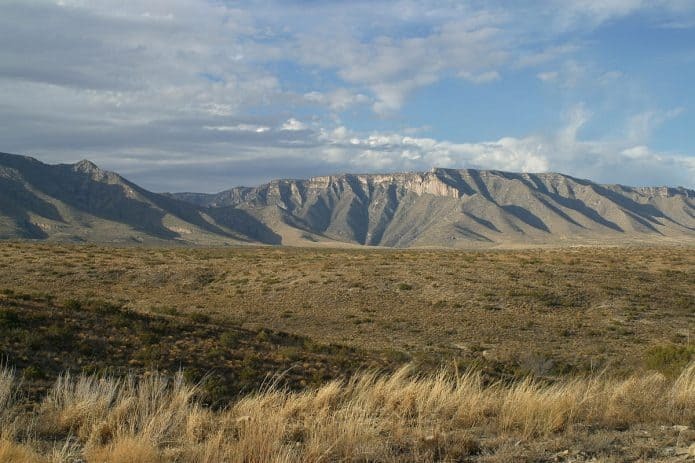 The park offers camping, horseback riding and plenty of hiking trails: Don’t miss the 3,000-foot climb to the summit of Guadalupe Peak, which leads to breathtaking views of the Chihuahuan Desert. Though it’s often overlooked, let’s not forget about the most tropical of the US National Parks in the Caribbean. The 14,737-acre Virgin Islands National Park covers nearly 60% of Saint John, plus all of Hassel Island (which is located off the coast of Charlotte Amalie Harbor on Saint Thomas). 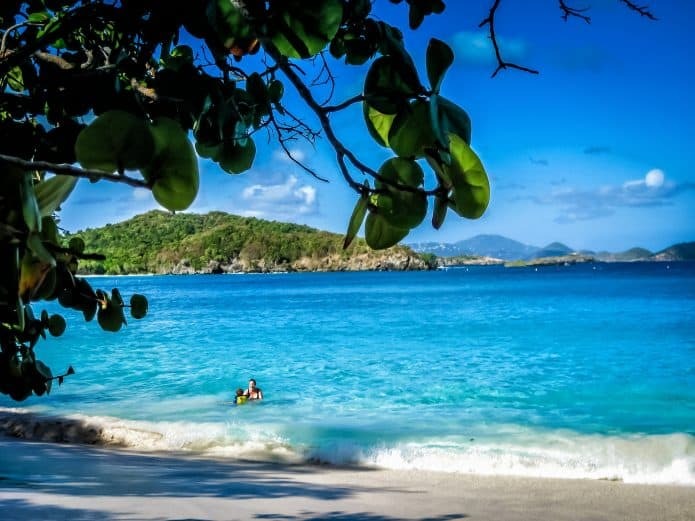 The park’s most famous attraction is Saint John’s Trunk Bay, which showcases a perfect white sand beach and an underwater snorkeling trail. It’s not uncommon to see Trunk Bay make annual lists of the world’s best beaches. The bay is easily reached by flying into Charlotte Amalie on Saint Thomas and taking the Red Hook ferry to Saint John. 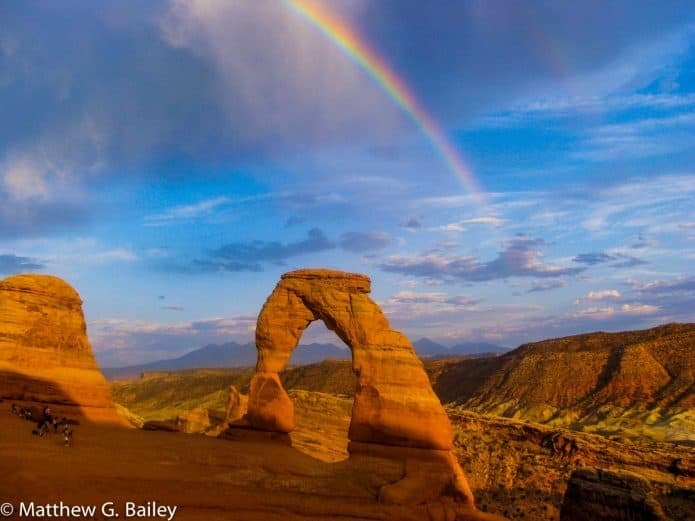 There’s a reason Arches National Park is featured on many Utah license plates. Located 233 miles from Salt Lake City, it’s incredibly unique, with over 2,000 natural stone arches as well as huge pinnacles, giant fins and enormous balanced rocks. It was extremely hot in late June when my wife and I visited, but the two-hour hike to the iconic 60-foot arch above was worth it. Its size is unbelievable when you’re standing under it, and you can see Colorado in the distance. After an hour of gawking at the sensational surroundings, a crazy storm emerged seemingly out of nowhere and everyone took cover. Encompassing 35,835 acres in southwestern Utah, Bryce Canyon isn’t technically a canyon at all. It’s actually a collection of natural amphitheaters located along the eastern side of the Paunsaugunt Plateau. 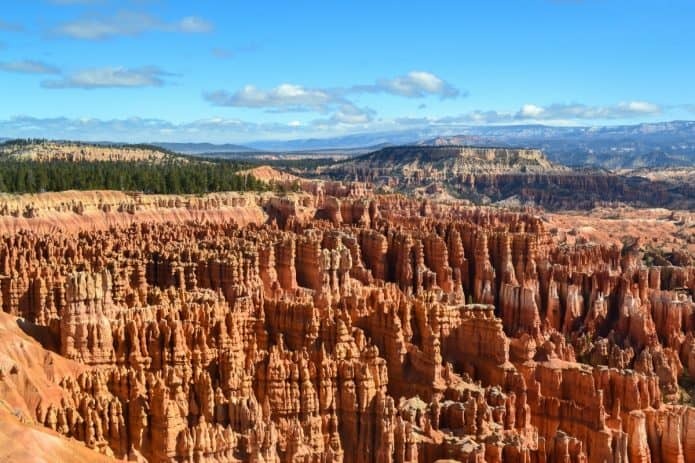 The place is filled with fascinating red, orange and white geological formations known as hoodoos, which are formed by weathering and erosion of sedimentary rocks in rivers and lake beds. All of the main viewpoints are easily drivable, and can be done in a half day’s time. But don’t rush through! Take it all in, savor the stunning views from the canyon rim, and consider a hike down to the hoodoo’s if you’ve got more time. At 527 square miles, Canyonlands is the largest national park in Utah and features deep canyons, mesas, arches, domes and petroglyphs. 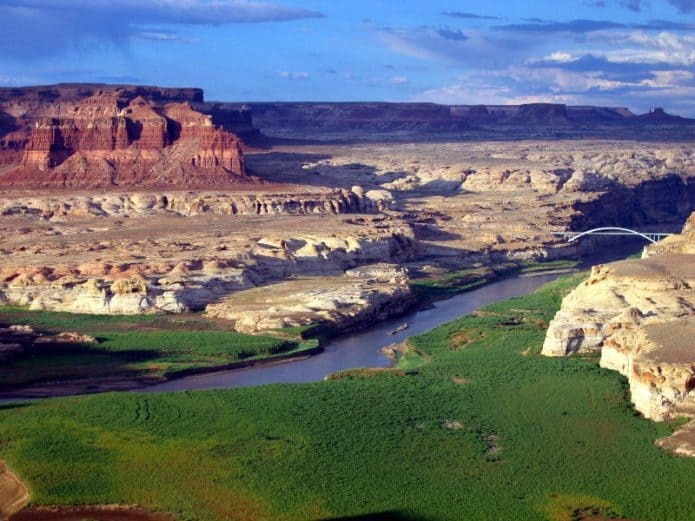 The Colorado and Green Rivers subdivide the park into four distinct districts– the Needles District, the Island in the Sky, The Maze, and Horseshoe Canyon. Each has its own distinctive character. The park offers numerous hiking trails with varying degrees of difficulty. There’s the arduous Syncline Trail Loop, the steep Murphy Point Overlook trail, and the easy Neck Spring Trail and Mesa Arch Trail, just to name a few. Humans first inhabited Canyonlands over 10,000 years ago. Some of the best examples of their art remain on the cliff walls of Horseshoe Canyon, which can be seen on the daily guided tours. 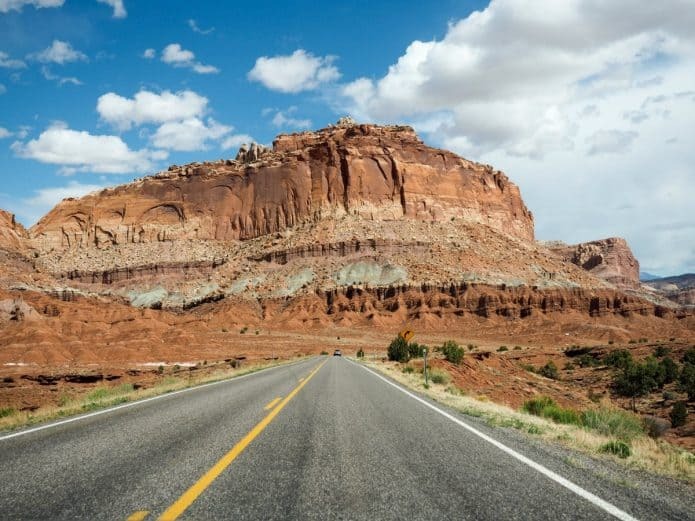 When it comes to the “Mighty 5” national parks in the state of Utah, there’s one park that definitely gets overshadowed by all the rest: Capitol Reef. It’s not as well-known as Zion and doesn’t have the iconic rock formations of Bryce Canyon or Arches. But it’s still well worth a visit. Along with a 65-million-year-old wrinkle in the earth’s crust called Waterpocket Fold, Capitol Reef also boasts canyons, domes, and even ancient petroglyphs. If you’re driving between Bryce/Zion and Canyonlands/Arches, be sure to set aside enough time to take the Capitol Reef scenic drive. 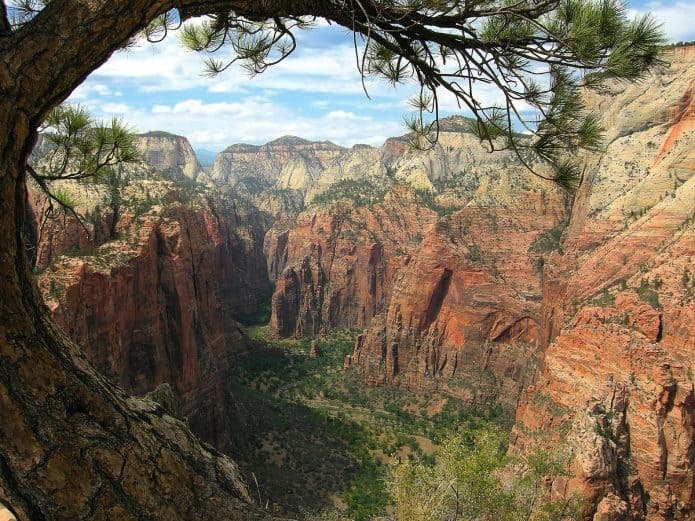 Attracting around 3.6 million visitors annually, southwest Utah’s Zion is the 6th most popular national park in the US. But, at just 229 square miles (compared to Yellowstone’s 3,500 and Grand Canyon’s 1,900), it’s also among the most overcrowded. After taking a gander at its striking geological formations– reddish rock towers, epic sandstone canyons and jagged cliffs that are the stuff classic westerns are made of– it’s easy to see why. Home to Native American tribes such as the Anasazi for centuries, the area was settled by the Mormons in the early 1860s. 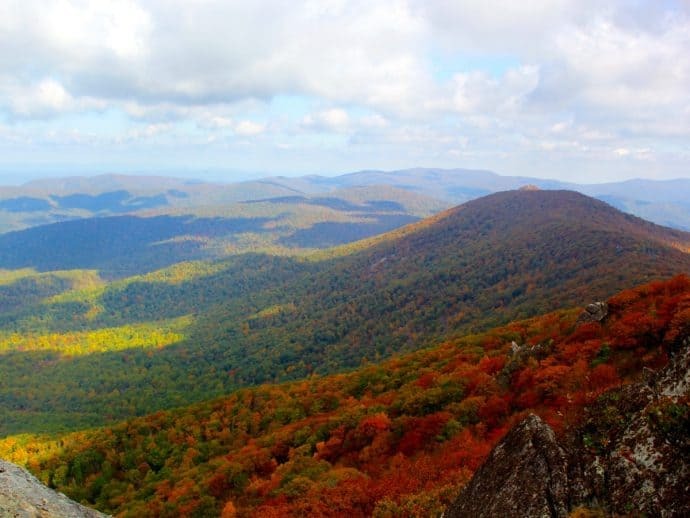 Shenandoah National Park is a beautiful year-round destination located just a 2-hour drive from Washington, DC. The 100-mile Skyline Drive winds along the spine of the park, tempting visitors with spectacular views from 75 different scenic overlooks. An extensive trail system offers short walks to gorgeous vistas and waterfalls, while serious hikers can tackle multi-day trips on the Appalachian Trail. Shenandoah makes an excellent DC day trip, especially when the Fall foliage soaks the mountains in color. But do try extend your stay in one of the park’s campgrounds or lodges if you can. When it comes to natural wonders, nothing compares to the Pacific Northwest’s striking, Alp-like Mt. Rainier. Declared a national park in 1889, it has served as a home for many Native Americans, as well as a playground for outdoor sports. 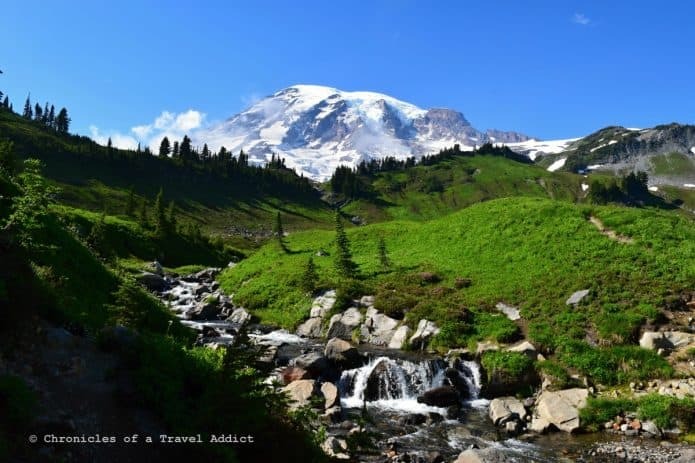 Hike one of its many verdant trails from Paradise, revel in its astonishing display of wildflowers, bask in the mist of Narada Falls, or take a gondola to the Summit House Restaurant for incomparable views of the valley. 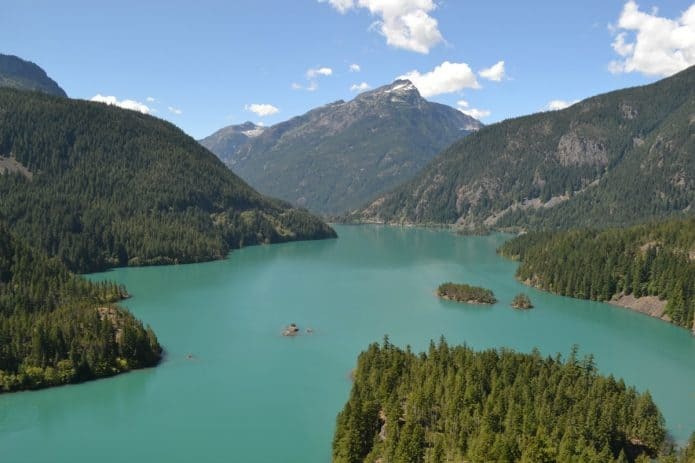 North Cascades National Park is located in Washington state less than 3 hours from Seattle. Its 504,781 acres ranks among the most beautiful areas I’ve seen in all my travels. There is a wonderful Visitor Center as you enter the park, with helpful, knowledgeable rangers scattered around at the most popular trails and stunning scenic lookouts. The park offers ranger-led programs along with the ability to hike, swim, bike, kayak, birdwatch, camp and more. You need a pass to park, but not to drive through the 9,000-foot landscapes (which include more than 300 glaciers). Olympic National Park doesn’t get as much press as the “biggies” like Yosemite. But it’s one of my favorite national parks — and I’m surely not the only one who has a sweet spot for it. Washington’s Olympic Peninsula is pretty easy to get to from Seattle and Tacoma by car, and the ferry system is as reliable as it can be (weather dependent). On the peninsula, Olympic National Park is almost a million acres big. Within all that space, there’s room for wild, rocky beaches, snowy mountains and glaciers, and temperate rain forests. Smaller than many other US National Parks, Grand Teton spans about 484 square miles in Wyoming before connecting to Yellowstone National Park. A great starting point to begin your adventure through the park is the famous town of Jackson Hole. The Teton Mountain range itself is remarkably tall and steep, with mountains that stand out sharply at elevations ranging up to 13,775 feet. The park is home to a wonderful array of wildlife, including Bison, Yellow-bellied Marmot, Moose, Elk, Deer, Antelope and more. The first national park established in the United States in 1872, Yellowstone was also the first national park in the world. The park hosts amazing natural wildlife, varied ecosystems and landscapes, and out-of-this-world geothermal features. This includes the world-famous Old Faithful Geyser, which is the park’s most popular attraction. One of my favorite walks and landscapes worth visiting was the Midway Geyser basin. 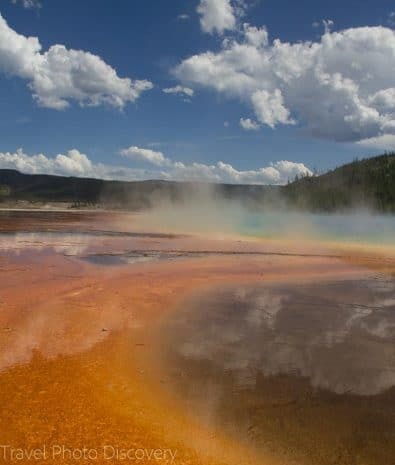 The basin contains a small collection of mammoth-sized springs, with colorful pools created by the minerals attracted to the extreme heat of the pools. The surreal colors and dazzling environment are just spectacular to witness and photograph in person. How many National Parks are there in the US? There are currently 59 U.S. National Parks. What is the Largest National Park in the US? At over 13.2 million acres, Wrangell–St. Elias is the largest National Park in the US. What was the First National Park? Yellowstone is the first national park established in the United States in 1872. It was also the first national park in the world. What is the Newest National Park? 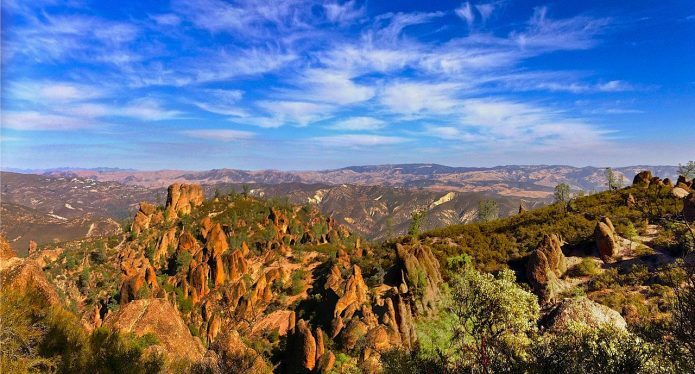 Pinnacles National Park became the Newest National Park in 2013. What is the Least Visited National Park? What is the Most Popular National Park? 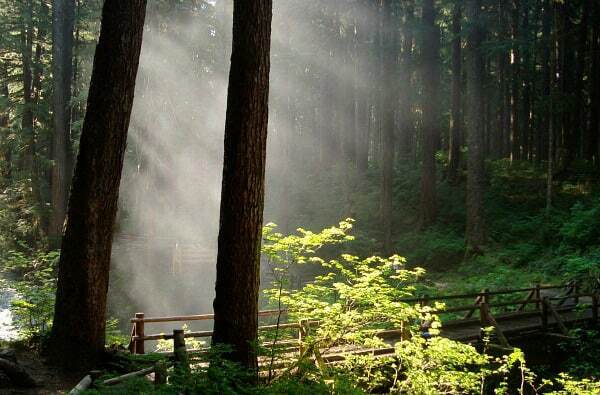 With over 11.3 million visitors, the Great Smoky Mountains National Park is the most popular National Park. What is the state with the Most National Parks? 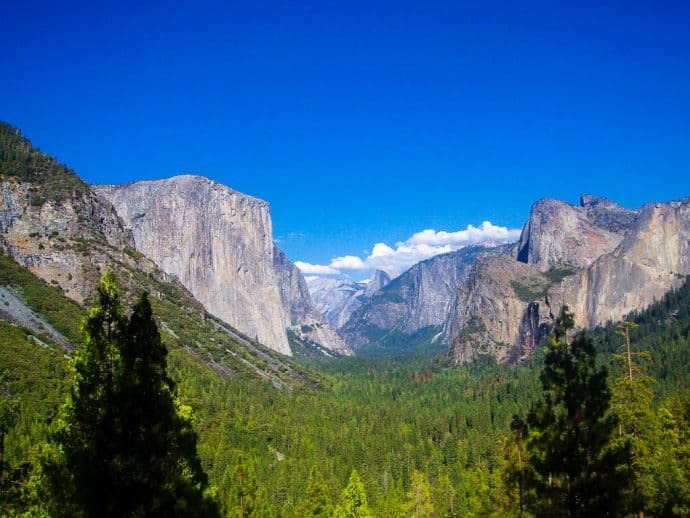 California has the most National Parks (nine). No. Only twenty-eight states have national parks. How many National Parks are there in the World?